The first 10 satellites in Iridium’s next-generation mobile voice and data network could head into orbit from California as soon as Dec. 16 on SpaceX’s first Falcon 9 flight since a booster exploded on its launch pad at Cape Canaveral in September, grounding the commercial launcher more than three months. Iridium said Thursday that the launch from Vandenberg Air Force Base in California is scheduled for Dec. 16 at 12:36 p.m. PST (3:36 p.m. EST; 2036 GMT), pending regulatory approval from the Federal Aviation Administration, the agency responsible for overseeing commercial space launches. SpaceX has not launched a rocket since a Falcon 9 exploded during a prelaunch test at Cape Canaveral on Sept. 1, destroying the launcher and the Israeli-owned Amos 6 communications satellite on-board, and damaging the company’s primary East Coast launch facility. 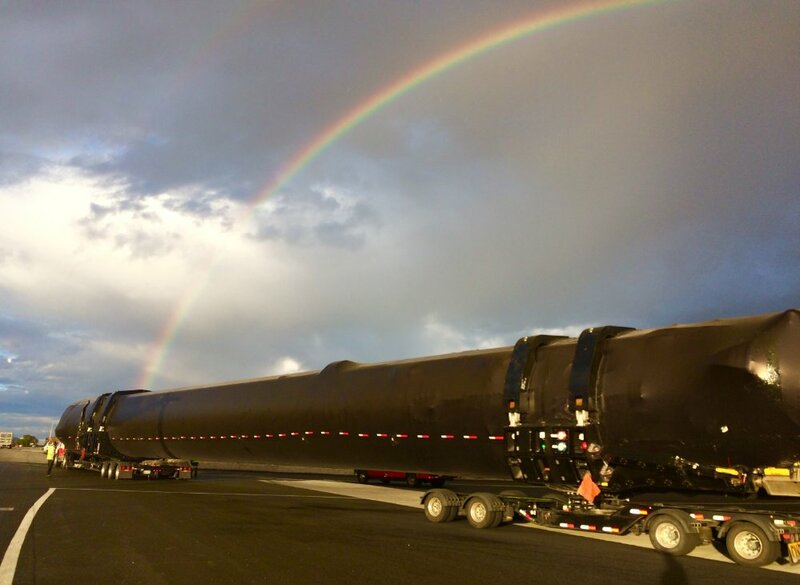 Near-term Falcon 9 missions will blast off from Vandenberg and launch pad 39A at Kennedy Space Center, a former space shuttle facility which SpaceX leases from NASA and is modifying for Falcon 9, Falcon Heavy, and crewed flights. The launch of the first 10 Iridium Next satellites was next on SpaceX’s manifest after the doomed Amos 6 mission, and it remains first in line after the company’s schedule shuffled in the wake of the Sept. 1 pad explosion. 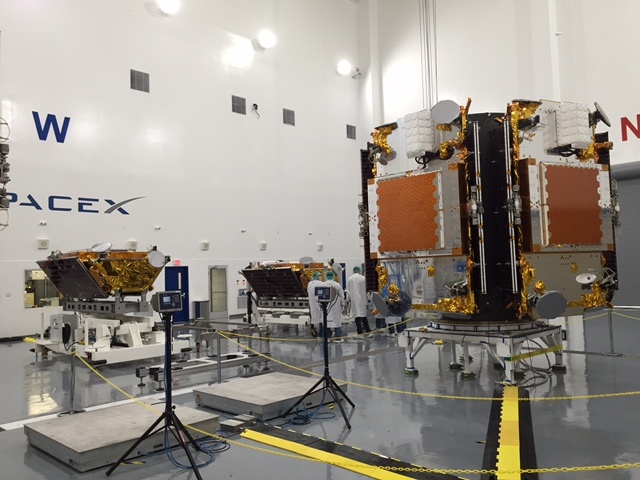 The 10 satellites were delivered two-at-a-time to Vandenberg from their Orbital ATK factory in Gilbert, Arizona, in August for a planned launch in mid-September. Preparations were halted after the launch pad accident at Cape Canaveral. Work has resumed inside SpaceX’s clean room at Vandenberg, with the final steps before launch including the attachment of all 10 spacecraft — designed by Thales Alenia Space and built in partnership with Orbital ATK — to a SpaceX-provided dispenser. The deployment mechanism has two tiers, each holding five of the satellites. Once technicians connect the craft to the dispenser, they will load hydrazine fuel into each satellite. 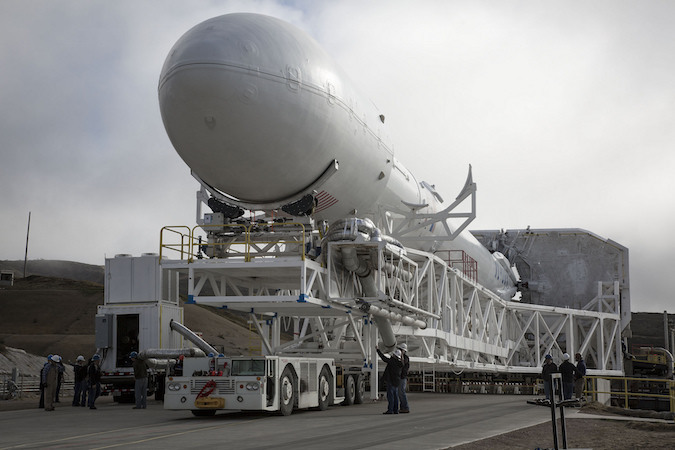 The spacecraft will each weigh nearly 1,900 pounds — about 860 kilograms — with a full tank of propellant. Then the satellites will be encapsulated inside the Falcon 9’s payload fairing, and connected to the two-stage rocket inside the horizontal integration hangar near Space Launch Complex 4-East. But first, SpaceX plans to run the Falcon 9 through a customary preflight static fire test, the same procedure that resulted in the explosion at Cape Canaveral in September. Iridium officials have said they will not put their satellites on the Falcon 9 rocket until the static fire test, which includes fueling of the booster and a brief on-pad engine firing, is successfully completed. 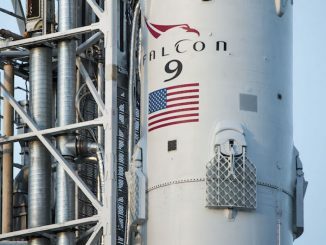 The Falcon 9 rocket will place the first 10 next-generation communications satellites into a polar orbit around 388 miles (625 kilometers) above Earth. From there, the satellites will use on-board thrusters to maneuver into their final positions in the Iridium constellation. SpaceX will launch 70 Iridium Next satellites aboard 10 Falcon 9 missions from Vandenberg under a contract signed between the companies in 2010. Thales Alenia Space and Orbital ATK are manufacturing 81 satellites for Iridium, which is still discussing launch options for the remaining 11 spacecraft. The launch delay caused by the grounding of the Falcon 9 rocket will mean the Iridium Next constellation will not be fully deployed until at least early 2018, a few months later than Iridium’s long-standing goal of having the satellites all in orbit by the end of 2017. SpaceX founder and chief executive Elon Musk told CNBC last month that investigators believe they have narrowed the likely cause of the Sept. 1 mishap to a problem during filling of the rocket’s second stage with super-cold liquid oxygen. The explosion occurred about eight minutes before the Falcon 9’s engines were to ignite during a hold-down test. The oxygen likely froze solid and caused a high-pressure helium tank to burst, blowing the upper stage apart almost instantly, and leading the rest of the rocket to collapse in a fireball. The helium is used to pressurize the second stage’s propellant tanks for flight. Musk said engineers believe they can fix the problem with a change in fueling procedures, avoiding major hardware changes that would have kept SpaceX missions grounded longer. The explosion was the second loss of a Falcon 9 mission, coming just over a year after a rocket disintegrated about two minutes after liftoff in June 2015 with a Dragon supply ship heading for the International Space Station. Meanwhile, SpaceX is completing upgrades to launch pad 39A in Florida to resume launches there as soon as early January. 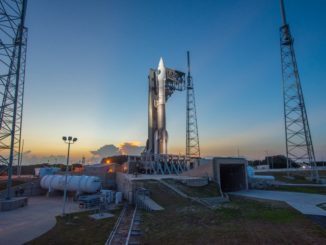 The EchoStar 23 communications satellite, a geostationary platform made by Space Systems/Loral, is scheduled for liftoff from pad 39A as soon as Jan. 8 to begin a mission beaming direct-to-home television programming over Brazil. 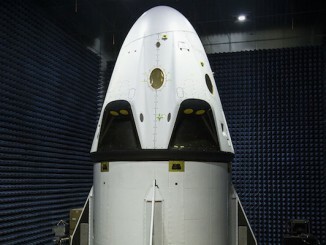 After EchoStar 23’s launch, SpaceX is readying its next Dragon cargo mission to the space station for a liftoff that could occur by the end of January, along with the first launch of a previously-flown Falcon 9 first stage booster with the SES 10 communications satellite in January or February. The order of SpaceX launches after EchoStar 23 remains undecided.